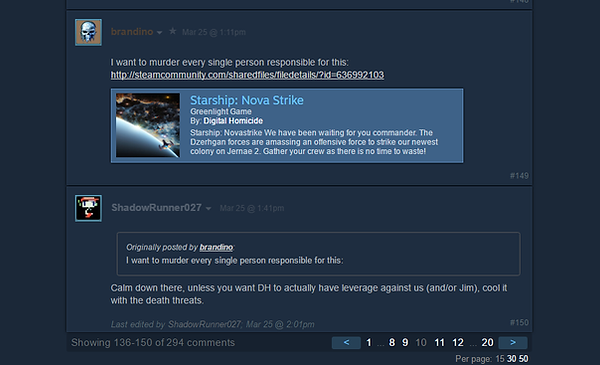 Digital Homicide have responded to Valve’s removal of their games from Steam, and now appear to be preparing legal action against the company. The studio has released their own statement, addressing the removal of their games from Steam on Friday. The statement addresses harassment in Steam comments and Valve not taking action against offenders. It’s a lengthy post, so to keep the context, here it is in full along with a selection of examples they are highlighting. A comment from a steam user who was reported a multitude of times with over 2,000 posts over 18 months and never taken care of for ongoing harassment. Here is another user who was flagged and a moderator actually banned someone for disruptive behavior but the original poster wants me to kill myself, mentions my family and has a moderation flag. The statement was likely posted by the studios’ James Romine who now has nothing to lose now that the revenue stream from Steam has stopped. He’s seeking legal counsel to take further action against Valve and is encouraging anyone who wants to take on the case to get in touch. Somehow I doubt anyone would want to take this on. The removal of their games from Steam came after issuing a subpoena to Valve on Friday requesting they release details of 100 Steam users who had left negative reviews or comments about their games.